Make arms and legs: Cut 2 pieces, each about 4 inches long, from brown pipe cleaners. Hold a pinecone (about 2 inches long) so bottom end points up. Tuck 1 piece of pipe cleaner between the scales of the pinecone, positioning it as the arms. Position the other piece as legs. Secure with a hot-glue gun. Bend ends of legs to make feet. Make head: Hot-glue a 3/4-inch wooden craft bead (hole side down) to the end of the pinecone. Draw 2 eyes with a black felt pen. Dab a small, dry paintbrush into red acrylic paint; blot. Lightly dab on wooden bead for rosy cheeks. Make mittens: Print and cut out the mitten template. Stack 2 pieces of felt. Place mitten template on top and trace with a disappearing-ink pen; cut out shapes. Repeat to make another pair. With matching thread, use a tight whipstitch to sew together pairs of mitten shapes. Make shoes: Print and cut out the shoe templates. Stack 2 pieces of felt. Place shoe templates on top, and trace with a disappearing-ink pen. 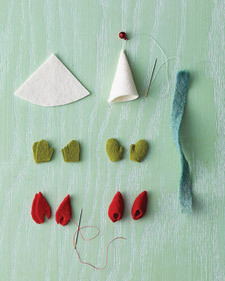 With matching thread, use a tight whipstitch to sew 1 teardrop piece to 1 notched piece around the point of the teardrop. At the rounded end, pull the notched ends together to make the shoe's opening. Repeat.